Welcome to the Sheffield Pub Quiz. There are 262 Sheffield pubs pictured in this quiz. The Quiz comes in two flavours, a full bodied selection of 30 or a half pint shandy of only 18 pubs. Whichever you choose, you get a random selection of pubs so that every quiz is unique. To make it a challenge, the name of the pub has been blanked out. Select the pub you think it is from the dropdown menu, you have three goes per pub to get it right. You need to have attempted at least 80% of the questions before you can see the answers. Click a button below to start. The name that appears on the list is the name that was written on the pub at the time the picture was taken. A broadband connection and a minimum screen resolution of 1024 x 768 is recommended. 30 May 2007 26 pubs added, from Manor Top, Gleadless, Frechville, Woodhouse and Crystal Peaks. 2 May 2005 12 pubs added, from around Stannington and Lodge Moor. 20 April 2005 Minor tweaks to the quiz engine, to improve the randomness. 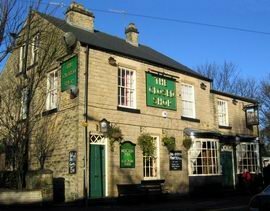 21 December 2004 12 pubs added, from Wincobank and Grimesthorpe. 3 October 2004 24 pubs added, from Norton, Jordanthorpe, Lowedges, Greenhill and Dore. 29 September 2004 A re-write of the main quiz page to make it more random has been completed. A bug in the previous version meant you could get the same pubs in the quiz repeatedly. 26 September 2004 14 pubs added, from around Pitsmoor, Parson Cross and Ecclesfield. 5 September 2004 I've added 22 pubs from around Burngreave, Attercliffe and Darnall. 1 February 2004 I've added a shorter version of the quiz, with only 18 pubs to identify. For people wanting to do a Sheffield Pub Quiz in a hurry. "Even though I have spent most of my adult life in these establishments I was hard pressed to get them all right, perhaps I should have spent some time outside them instead" - AndyH. "Top pub quiz" - KarenB. "I don't know any of these - But I've only been in Sheffield 6 months." - AnnaW. "This really is very good, keep up the good work" - Richard. "Do all these pubs sell Stella?" - Sue.